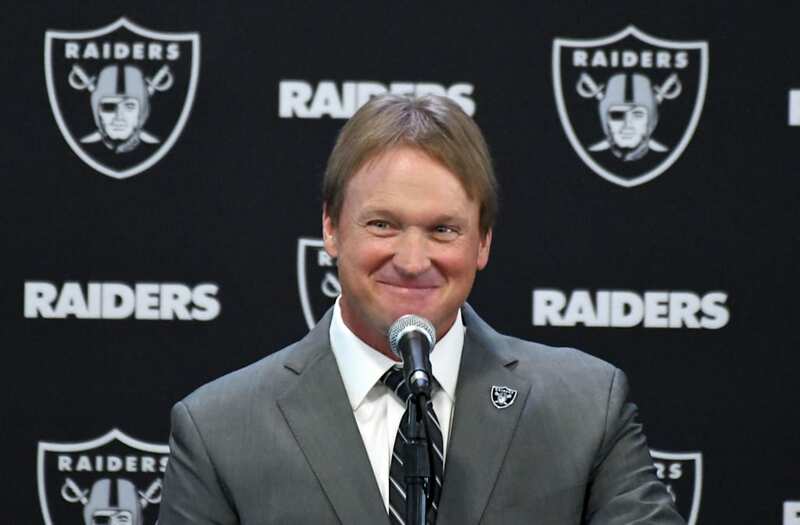 Jon Gruden made his return to the Raiders official on Tuesday, announcing at a news conference in Oakland, "I'm all in." Gruden coached the Raiders to a 38-26 record from 1998-2001. He spent the next seven seasons coaching the Tampa Bay Buccaneers to a 57-55 record and a Super Bowl title after the 2002 season. The Buccaneers ended the 2008 season with four losses in a row, and Gruden was fired following the season. Gruden, 54, most recently served as an analyst for ESPN and Monday Night Football. "I never wanted to leave the Raiders, I never thought I'd be back," Gruden told reporters. "But here I am and I'm ready to get to work. ... I love football. I love the players that play it. I love the preparation, I love the journey, I love football." Gruden said he has already begun immersing himself in the job. He said he's lined up former Cincinnati Bengals defensive coordinator Paul Guenther, Los Angeles Rams offensive coordinator Greg Olson and Dallas Cowboys special teams coordinator Rich Bisaccia to lead the coaching staff. Gruden downplayed reports from last week that his contract is valued at $100 million over 10 years. "I don't have a guarantee to be alive for 10 years," he joked, adding that he doesn't fully know the terms of the deal. "All I know is this year I'm going to be coaching in Oakland and next year I'm going to be coaching in Oakland. I want to help deliver the best football team we can for the people here in Oakland. "How long I stay here will be determined by how well we play."